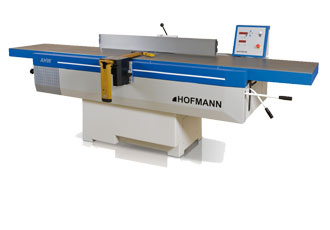 Hofmann Woodworking Machinery and Equipment from Rudolf Bass Inc.
Strong as single versions, unbeatable together! Without a doubt the unique combination of surface and thickness planer allows both operation modes without up-folding the tables - even at the same time! As a result time savings of 25% are very fast to reach. In addition up- and down-folding of the jointing tables is possible in every position of the thickness table, what's supposed to be another unique characteristic. The distinguished HOFMANN iron cast quality and the intelligent ergonomics round out the package perfectly. Precision and power meet highest reliability! Two pull-out rollers in the standard version, the four-fold table mounted on four spindles and double-row precision ball bearings on the knife shaft guarantee even after years best results without downtime. Here, too, the rock solid Hofmann quality is found and ensures the highest level of smoothness and ideal vibration damping. Proven technology for perfect planing results! 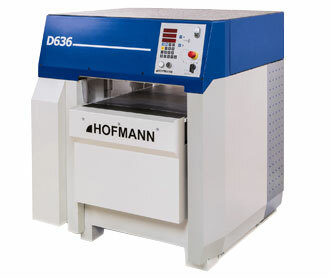 Every surface planer is made of the legendary long-life and vibration-absorbing HOFMANN cast iron quality. Jointing tables of 3.000 mm lenght (1.500 mm each) with finest planed surface provide a perfect work space. A maximum of ergonomic comfort is guaranteed by extra foot room in the lower frame for example. Furthermore the complete jointing fence with smooth-running roller guides can be adjusted by just one hand and is pivotable till 45 degrees. All control elements are reachable from the operating position all the time. CE-conform , BG-wood dust mark no. 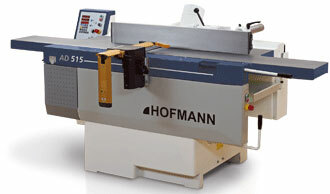 081040"
We can help you obtain new machinery from Hofmann just ask us!